Note: This is not a sponsored post. I love the product so much that I’m recommending it to everyone. I usually bring a cap or hat whenever I go out of town. Aside from protecting my head from the elements of nature, it also keeps my hair from getting messed up. Call me a little vain but we all know how bad hair days feel. I can’t recall how many times I’ve lost my caps whenever I travel. But I’m glad that there are products out in the market that are created out of innovation. Headware: Keep Your Head Happy! I visited R.O.X. Philippines Fort Bonifacio so I could claim my prize when I won a Mountain Hardwear Scrambler Backpack. During that visit, my friend showed me this travel gear which she was intent on buying. I gave a second thought when I looked at the price but still purchased it (at 240 Php) considering that I already got the backpack for free. 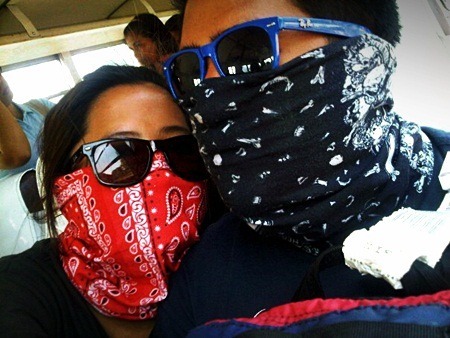 I also carry a bandana around when I want to wipe sweat and cover my face whenever I travel on a dusty road. But this garment not only serves as a hat or a mask; you can also use it as a scarf, headband, beanie, balaclava, wristband and so much more. I put this Headware to good use during a recent trip to Sagada as it kept my head and ears warm from the cold climate. Funny how we were influenced by the Sole Sisters and how we influenced fellow travel blogger, Carla, and her husband James to buy one for themselves too. With its fabric being stretchable, I can just wear it around my neck and I won’t even have to worry if it’ll get lost cause I know it’s securely attached. You can carry it in your pocket like a handkerchief cause it’s light and doesn’t take a lot of space too. This Headware multifunctional gear is not only limited for travelling. One time, I was jogging in Cebu and I used this to cover my neck and my nose from the metro’s pollution. It also became an effective disguise to hide myself from people I met along the way. The Headware’s fabric is breathable so air passes through easily but it also serves as an insulator to keep you warm from the cold weather – very clever indeed! 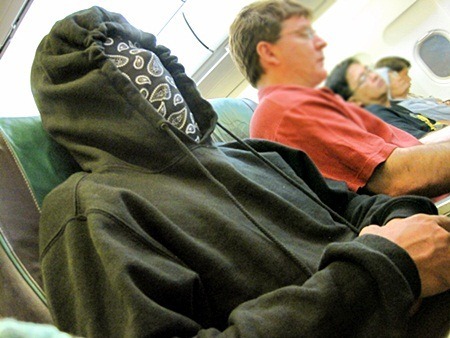 My favorite use for this would be as a mask whenever I take a nap during those long hours of travel. But even at home, since I work on the night shift nowadays, I use this to cover my eyes from daylight. It helps lull me directly to sleep. If you’re lucky, your airplane seatmate won’t even mind. I’m not certain if I have convinced you enough to purchase one for yourself. In any case, I’m just spreading the love because of how convenient this is for people who are always on the go. Funny man, Rovilson Fernandez, demonstrates how you can customize this Headware gear according to your liking. Headware is available in all R.O.X. branches nationwide. 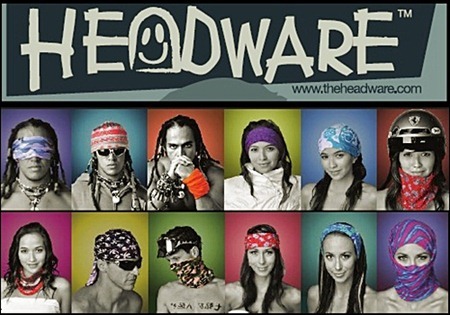 You may visit their website at theheadware.com to check out other stores carrying this handy travel essential. Do-Not-Disturb mode aka Darth Vader Style. Cool headware! "If you’re lucky, your airplane seatmate won’t even mind." – parang he did mind at parang lumalayo sya sayo. Hahaha! @nel: really cool! you should get one! just this moment, two people contacted me on where they could buy one for themselves! kakatuwa comment ni Gay. parang kailangan ko bumili ng headgear. astig talaga ang R.O.X. i bought three and gave one to my cousin who's a skateboard fanatic and is now based in HK. all his friends are asking where he got it. by the way, i bought mine in R3public in Trinoma mall! Nice post Ed, highly recommended this one! 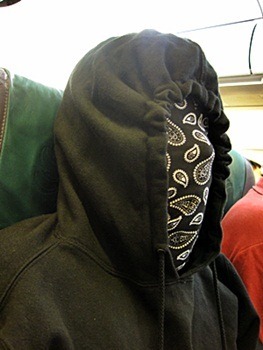 @dong ho: haha, who wouldn't be taken aback with a masked passenger as a seatmate? astig talaga ng R.O.X. daming mga gear na gusto mong bilhin kahit wala kang balak bumili! @tagadavaoko: ey, i placed the price in the entry. Please read: "I gave a second thought when I looked at the price but still purchased it (at 240 Php) considering that I already got the backpack for free." Thanks for the recommendation! Can't wait to check them out! And LOVE the pics on the plane, I get so self conscious sleeping on a plane that'd help a ton! I really want one of those… sana mapadpad ako sa ROX one of these days… sa ROX lang ba cya available? @Chyng – panalo ka talaga! basta libre! wahahaha!!! PERNES! Pernes talaga. Ang cool nung video. Mapapabili talaga ako nito and medyo mura lang. Medyo concerned lang ako sa pattern na available. Hehehe. But I really love it, love the concept. Sana makabili ako before my summer adventures. Hahaha. ay cge, check ko sa ibang stores, medyu effort kc pumunta ng The Fort eh… hehehe! Thanks ed! Ayos. I need this! Sana magkaroon pa ng madaming designs. @pinoy adventurista: haha. onga. go go go! @vin: this looks cooler hehe. @rome: these are great for those climbs right? Just saw this now! Thanks for posting Ed. Just reposted it on our FB page. I'm glad you love headware as much as we do! Depende ata sa print/patterns yung price, Ed. 🙂 The plain black one I bought only costs PhP170, the other colorful printed ones I have are PhP240 nga. Depende ata sa print/patterns yung price, Ed. The plain black one I bought only costs PhP170, the other colorful printed ones I have are PhP240 nga. Very useful, I used it almost everywhere – as head and neck cover for the cold in Benguet, face cover for dusty roads during climbs, pang-cover ng hair from the sun, etc. Pero yung the best purpose nya for me is pang-DND mode din, pag natutulog sa travel. Andami ko kasing stolen shots na nakanganga habang tulog. Haha! I could actually use one of these where I'm at since it is cold most of the year. Finding something to cover yourself and still make it breathable is kind of hard to find sometimes. Unfortunately it is just starting to warm up here, but I'll still check it out since I know it will just be cold again next year. @lois: no prob lois, just spreading the headware love! @steve: you can always use this to cover your neck from the rays of the sun! this has so many uses steve! @renevic: haha, napapabili talaga noh? hehe..